At Crofton, we know there is no substitute for the skilled professional diver. Technology has greatly enhanced underwater inspections, but the skilled diver provides critical information from the black-water environment. While our vessels are equipped with cutting-edge search-and-find tools and technology, nothing is more precise than a certified diver. Our skilled professional divers ensure accurate data and analysis from the first look through completion of the final report. Our eyes-and hands-on approach delivers actionable results of the team’s efforts. Whether you are trying to recover cargo or conduct an underwater inspection, you can put your trust in Crofton. From bridge and tunnel repairs to underwater dock construction, we’ve been called on for some of the most complex jobs in the region. Our arsenal of tools includes ADC compliant surface supplied air systems, underwater air and hydraulic power tools, decompression chambers, digital video recording systems, digital underwater photography, non-destructive testing equipment, underwater utility locators, underwater burning and welding gear, and remotely operated vehicles. You can rely on our professional divers. Crofton has provided these highly technical services since 1949. Our staff includes engineering technicians and qualified inspectors trained under the Federal Highway Administration (FHWA) and National Bridge Inspection Standards (NBIS). With more than 65 years of experience, we’re able to cross-reference from hundreds of similar projects to successfully complete operations on time and within budget. When thousands of souls depend on your work, you can’t settle for second best. Crofton has been ensuring the safety for the traveling public for more than half a century. We have provided inspection services for local and state agencies across the eastern seaboard, including the first-ever full underwater inspection contract for the Chesapeake Bay Bridge Tunnel in 1985. We are a leader in underwater and topside investigations because we deliver results. We successfully mobilize state-of-the-art equipment and trained and experienced professionals to provide comprehensive inspection and analysis. We continue to provide this critical service for the CBBT Authority as well as many other clients. Through extensive education and training from the National Highway Institute and the Federal Highway Administration, Crofton’s inspectors exceed requirements of the National Bridge Inspection Standards. Further, our Association of Diving Contractors International-compliant dive team members and registered professional engineers provide a level of professionalism that cannot be matched in the industry. Underwater inspections require special skills and equipment. Crofton Diving Corporation has invested a significant effort in obtaining highly accurate underwater ultrasonic non-destructive test equipment and in employing Level I- and II-qualified non-destructive testing technicians. With our state-of-the art equipment and professionally trained staff, we can provide detailed and accurate measurements of your underwater facility components. Our inspection services don’t end with bridges. 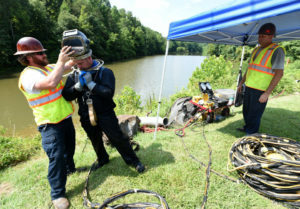 Crofton Diving also has years of experience providing services to numerous industries and public utilities that maintain subaqueous pipelines requiring routine inspection, cleaning and repairs. We also have the extensive resources and experience necessary to design and install new pipelines. Underwater structures require inspection for numerous reasons, such as post damage, reliability verification and as-built conditions. Crofton professional divers and engineers will ensure you obtain accurate, timely and thorough assessments for all of your underwater structures. Contact us for all of your inspection needs. Let us put our years of experience to work for you. Crofton Diving Corporation has the resources and expertise to conduct salvage operations that only years of experience can provide. From location to assessment to recovery, Crofton Diving Corporation is your complete source for a successful salvage operation. 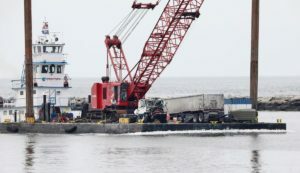 For more than half a century, Crofton Diving Corporation has been serving the port of Hampton Roads’ shipping industry and the U.S. government. 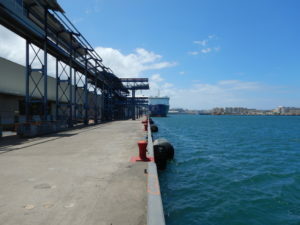 We can and have provided the following services to every port and shipyard in the region. cathodic protection system anode replacement. Whether you’re planning a new project or need emergency service, call Crofton. We have crews ready to respond at a moment’s notice to any location in the United States and abroad. We’re available 24 hours a day seven days a week. Cofferdams are most frequently used during construction of bridges, tunnels, piers and other in-water and underwater structures. If you are in need of a temporary support for your construction or excavation project, give us a call. Crofton Diving maintains a 200-plus stock of various sized cofferdams that are structurally engineered to service the many needs of our clients. Every project is unique, but we offer shallow water and deep-water cofferdams, in a variety of shapes. If we don’t have the specific size you need, we can design and build one that fits your project’s precise specifications. These in-house designed devices are available to provide emergency blanking operations for in-water repairs of systems on board vessels, interior to power, pulp, or chemical plants, and around exterior facility structures that require repair or rehabilitation. When it comes to the full service and maintenance of hydro-generation facilities, we’ve emerged as a winning team in the industry. Covering all aspects of hydro, fossil and nuclear power plants, our services comprise comprehensive underwater diving services as well as all aspects of heavy construction and restoration of your existing facilities. Our technical division manages the fields of subaqueous surveillance, dredging permit acquisition and both state and federal and complete non-destructive testing and evaluation of intake rack bars and draft tube structures. We also use remotely operated vehicles to enhance deep-water operations (up to 1,000 feet) for divers executing chamber operations. We have a long history of involvement in the hydro-and-water-resource structure industry, including diverse experience with spillway and moveable gate structures. We’re proud of our successful projects throughout the United States and the Caribbean. Our work has included spillway rehabilitation, sealing and rework operations and the repair and installation of numerous types of gate structures, including tainter gate, rising and nonrising stem-sluice gate systems, large jet-flow/sluice-gate combination structures, dead-lift spillway gate systems, flood-control structures with rework of hoist equipment, seals and facility structural repairs. Our client base includes major public power service organizations, private industries, municipalities and industrial plants.